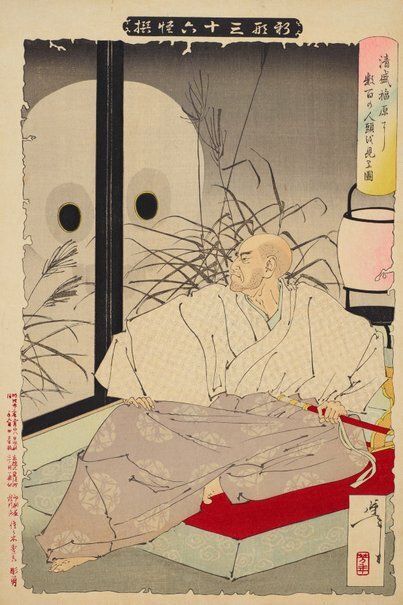 'Kiyomori Sees Hundreds of Skulls at Fukuhara' depicts Taira no Kiyomori (1118 –1181) who was a military leader during the late Heian period. By many he was seen as a manipulative character who was was able to move his way through the government ranks of the court to eventually gain great power and become chief minister. He was to make many enemies and many of his evil deeds were to be repaid when he would be tortured in hell. Moving from Kyoto, Fukuhara was the capital of the Japan for six months in 1180. Based on a story from the 'Tale of Heike' ('Heike Monogatari'), compiled prior to 1330, in chapter 5 it is noted that after the move, and while he was dying from a very high fever, strange ghosts and demons appeared to Kiyomori such as a face, skulls and bad dreams.